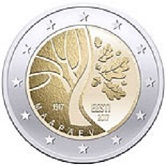 2017 yielded the same number of Commemorative coins as 2016 - 32. 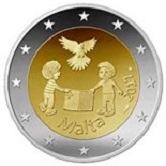 As 23 countries issue coins this means we had an average issue of 1.4 coins per country. 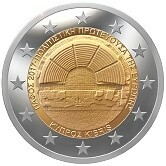 Cyprus issued its first Commemorative Coin - the Odeon built by the Romans in Pathos. 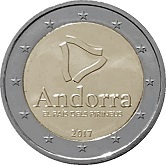 Andorra continued to issue behind time - its 2016 coins appeared in 2017 and I'm afraid the 2017 Commemorative Coins only appeared in 2018. 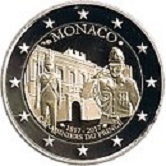 If it issues any 2018 Commemorative Coins it will be interesting to see when they appear! 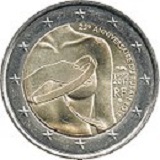 Another interesting feature is the French Commemorative Coin that appeared in September commemorating 25 years of breast cancer awareness. 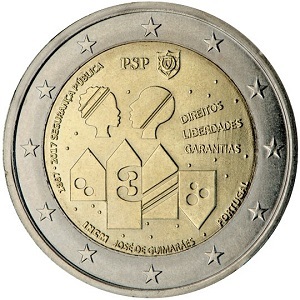 10,000 of these were minted with the ribbon coloured red. 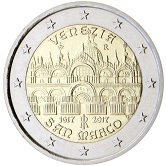 While they are theoretically legal tender they will almost certainly all be snapped up collectors and never appear in circulation. 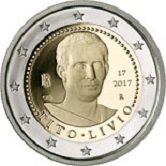 Hereunder are the commemoratives of 2017, arranged alphabetically by country rather than chronologically. 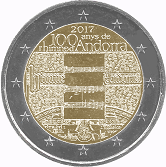 2017 - The 100th anniversary of the Andorran National Anthem. 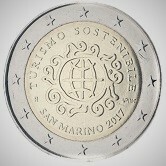 A 2017 Commemorative but only issued in 2018. 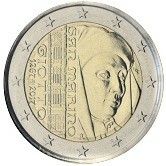 2017 - The coin honours Andorra. 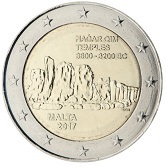 A 2017 Commemorative but only issued in 2018. 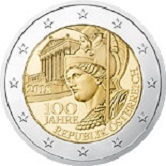 2017 - 100th Anniversary of the founding of the Republic of Austria. 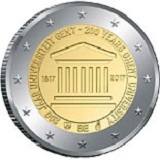 2017 - 200th Anniversary of the University of Ghent. 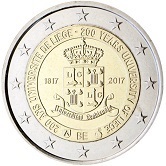 2017 - 200th Anniversary of the University of Liège. 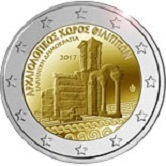 2017 - Pathos - European Cultural Capital. 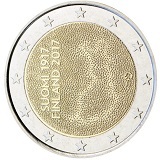 2017 - The coin is commemorates the 100th anniversary of Finnish independence. 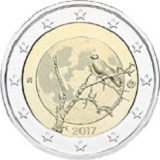 2017 - The coin is dedicated to nature and is here represented by a crane in a Finnish forest. 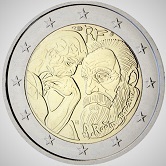 2017 - 100th Anniversary of the death of Auguste Rodin. 2017 - 25 years of Brest Cancer Awareness. 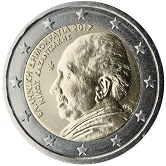 2017 - 60th Anniversary of the death of Nikos Katzanakis. 2017 - Archaeological Site of Philipi. 2017 - The Latvian Province - Kurzeme. 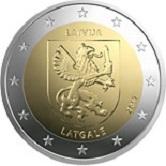 2017 - The Latvian Province - Latgale. 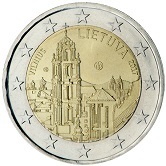 2017 - Vilnius City Panorama. 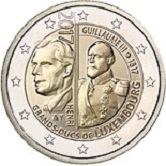 2017 - 50th Anniversary of the Creation of the Luxembourg Volunteer Army. 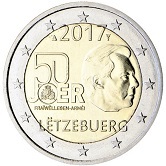 2017 - 200th Anniversary of the birthday of the Grand Duke William III. 2017 - Prehistoric Temple Complex of Hagar Qim. 2017 - Solidarity and Peace. 2017 - 200 Years since the establishment of the Compagnie des Carabiniers . 2017 - 150 Years of Public Security. 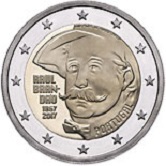 2017 - 150th Anniversary of the birth of Raul Brandao. 2017 - 750th anniversary of the birth of Giotto di Bondone. 2017 - International Year of Sustainable Tourism. 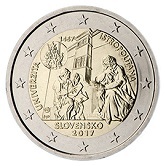 2017 - 550th Anniversary of the Founding of the Universitas Istropolitana. 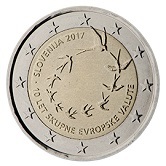 2017 - The 10th Anniversary of the Introduction of the Euro in Slovenia. 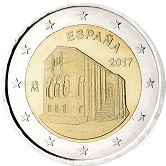 2017 - Santa Maria del Naranco Church now a UNESCO World Heritage Site. 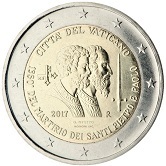 2017 - 1,950 years since the deaths of St. Peter and Paul the Apostle. 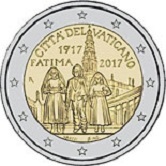 2017 - 100 years since the visions of Fatima. 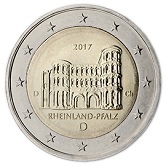 Return from Euro Coin News 2017 to euro coin collector.